If you’re anything like me, you’re wondering what on earth to feed a tiny baby when you start weaning. Are you trying to figure out what baby led weaning essentials you’re going to need? You’re possibly worried about choking, allergies and overloading their delicate tummies. With baby led weaning, you follow your baby’s cues, and go with the flow. I wanted to write a post on baby led weaning essentials because this is my 3rd time of doing embarking on this journey, and I have come back to these 6 things each time. First Of All, What Exactly Is Baby Led Weaning? You’ve got a parent and a baby happily playing aeroplane spoon games to encourage baby to open their mouth. There’s a bowl, pack or pot of veg puree cleanly placed in hand, and spoon to mouth action is happening. A little clean of the mouth and it’s all done. There are decapitated broccoli spears and toast soldiers flying off the high chair tray. The sippy cup of water is splashing on the floor. There’s yoghurt splatters on the wall and mashed potato getting smeared onto every limb. Baby led weaning is a very messy business, and you’re most likely going to be on your hands and knees wiping up tons of food 3 times or more a day. But the benefits of baby led weaning far outweight the messy negetives. Weaning starts with a proper high chair, and there are a vast variety of different styles to choose from. Currently at just £14, the Ikea Antelop High Chair has got to be one of the most popular baby products on the market today. Not only is it dirt cheap, it’s benefits far outweigh it’s basic aesthetics. It’s easy to assemble, and it’s easy to take down if you need to take it somewhere. It’s best feature in my opinion, it’s so easy to clean, and you can even put the seat and tray in the dishwasher! This is by far one of my best baby led weaning essentials. It’s an absolute WIN. When your babe is teeny, they do tend to roll around the high chair a bit if you have an upright one like the Ikea one above. This is where a high chair cushion comes in so handy when they’re small. 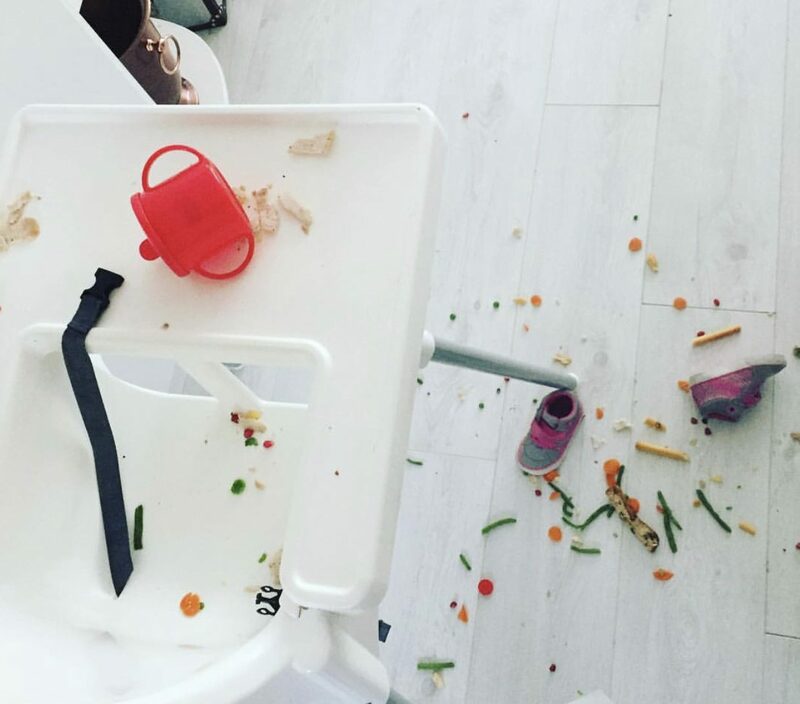 The particular one that I have (pictured) is from Messy Me, and it has made my all time baby led weaning essentials list. It looks so comfy for babies to sit within. It’s also wipe clean, and fits so well around their little bodies. When you’ve finished feeding you just whip it out (it’s not secured with any annoying clips or straps you need to unfasten) wipe it down, and pop it back in for the next feeding time. You can also fold this cushion up small for days you know that you’re going to need a highchair in a cafe or restaurant. We forgot it the other day, and we had to put a blanket and a coat around Beau as he kept wobbling around in the wooden restaurant high chair. That didn’t work, so I was kicking myself that we forgot the cushion. It’s available in a few colours and patterns, and one you can see in the picture you can buy here. Get a mat, whip it off the floor, wipe it all into the bin and wipe it clean. Job done. Time and knees saved in any setting. Bibs are also on the list of the must have baby led weaning essentials. These are an absolute must if you want to protect your little one’s clothing. Get a long-sleeved, cover-all bib such as these Pop-in Bibs by Close Parent – they are excellent. I’ve tried a few, and these by far are the best in my opinion. Look out for bibs with pockets at the bottom to catch food, and ones with an easy but secure button fastening. I’ve tried bibs with tie backs in two places, but they get hair caught, they come undone, and they’re too fiddly for hungry little ones. These bibs are also wipe clean, but they’re not so rigid that they are uncomfortable to wear. Bibs that you have to wash in the machine every time are a real pain, but equally, thick plastic ones don’t move with your baby enough. These are a perfect cross between the two. Poundland thrills me with this baby led weaning essential. For only £1 you can get 3 beautifully soft face cloths that you can wet down with warm water and wipe your baby’s face and hands with when they’ve finished eating. I tend to use one per day, then throw it in the wash. Not only does that save a ton of baby wipes, it’s less chemicals on their face, and better for the environment. I am a self-employed mum of 3, and things have to be easy, practical and streamlined in able for us all to live a happy and content life! That sometimes means that I reach for convenience foods. There’s absolutely no shame in buying pre-packed food, especially so at the beginning of your baby led weaning journey. They’re actually really great. Packed with fruits and veggies, no added salt or sugar. Pretty much the same as you would make anyway. You don’t know what foods and textures your baby will like, and you don’t know what your baby’s capabilities are. It can be frustrating to waste precious time figuring all this out, and a lot of money can be spent. I recently discovered Baby Led Foods. An emerging baby food brand who have really hit the nail on the head when it comes to providing healthy and TASTY food for little tummies. They have lots of different options, and are nothing like the usual suspects on the UK baby food market. They’ve got baby led spreads which are intended for breadstick and crudite dipping, spreading on pieces of bread or toast, and even stirring into pasta. We particularly like the dairy free pack due to our cow’s milk protein allergies. The Carrot, Apple and Hummus one is a particular favourite of Beau’s so far. More of their awesome products are these little packs of pre-steamed veg sticks. How amazing are these! All 3 of my kids enjoy these, not just baby Beau. These packs are also awesome to keep in the cupboard and fridge for packing into our kids lunch boxes and for days out. Healthy and tasty options that kids love to eat. There’s another baby led weaning win! So there you have it, 6 of my tried and tested baby led weaning essentials. You’ve got the highchair and the cushion, the splash mat, bibs and face cloths, and of course the food. Baby led weaning doesn’t have to be complicated, and once you’ve got the hang of having to feed a baby food instead of just milk, it’ll all become second nature in a short while. Enjoy it. Our babies certainly do.